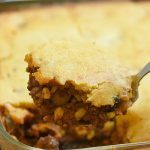 Tamale Pie is two classic comfort foods baked into one fantastic casserole. 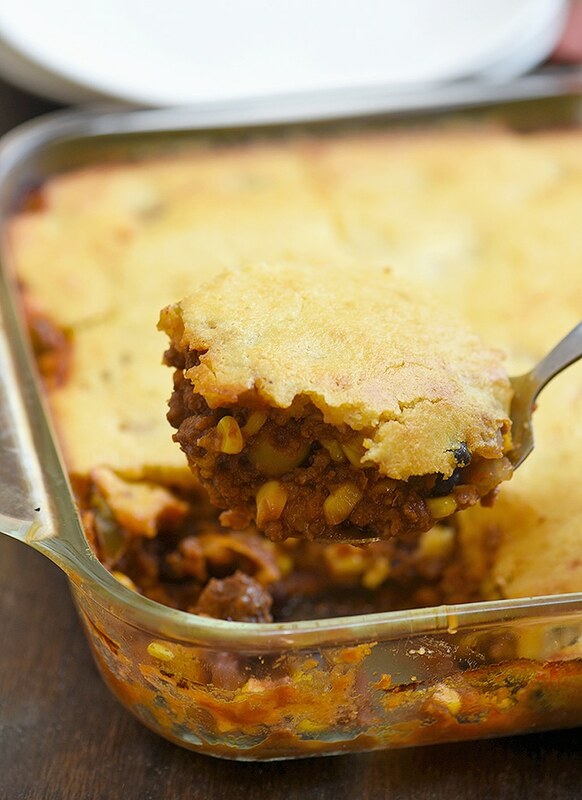 With seasoned beef and a golden cornbread topping, it’s a hearty and tasty weeknight dinner the whole family will love. 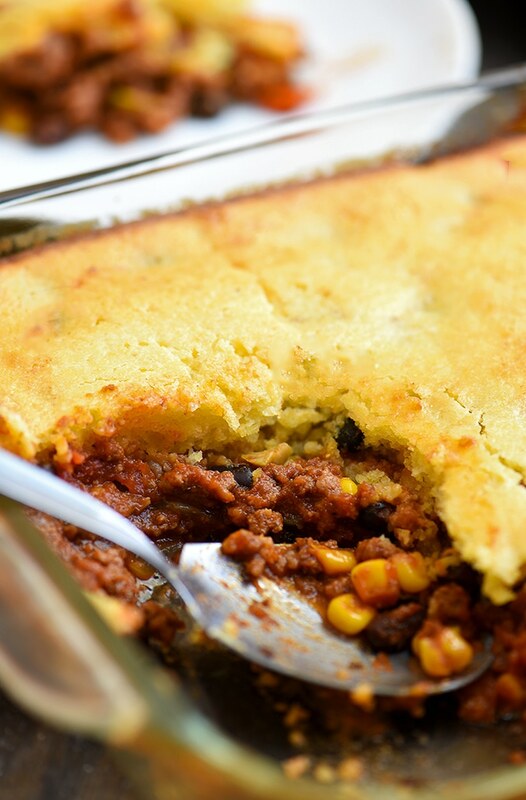 Chili and cornbread are one of G’s favorite comfort foods so he was pretty excited when I combined the two in one delectable dish and surprised him with a tamale pie for lunch today. Not surprisingly, he went back for seconds. And thirds. And then asked if I could refrigerate what little was left of the casserole to reheat for dinner later. 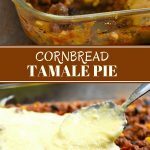 Tamale pie, in its basic form, is a savory ground meat mixture baked into a casserole with a delectable layer of cornbread topping. I usually use a variation of my beef chili or picadillo recipe but you can easily substitute shredded chicken, pork or your favorite tamale filling. The crust is traditionally made of cornmeal or masa harina but I like to use a box of Jiffy to simplify the process. In a wide pan over medium heat, brown ground beef with onions, bell peppers, and garlic. Add diced tomatoes, tomato paste, and broth. Season with chili powder, cumin, cayenne pepper, salt, and pepper. Lower heat, cover, and simmer until beef is tender. Add corn, black beans, and olives and continue to cook until heated through. 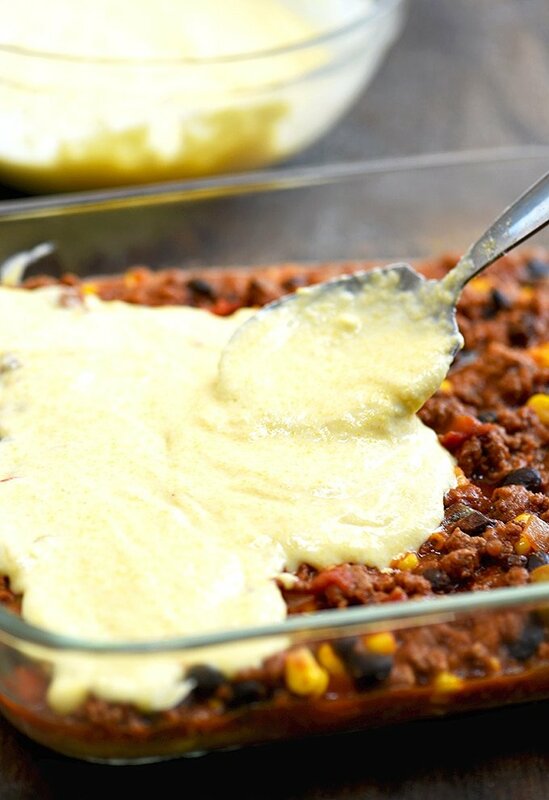 Transfer tamale pie filling in a lightly greased 9 x 13 casserole or baking dish. For a more fun dinner, you can also divide the beef mixture and cornbread topping in ramekins and bake into individual pies. In a bowl, beat together one egg and one cup of milk until well-blended. Add Jiffy cornbread mix and stir just until combined. Spoon over beef filling mixture, spreading evenly to completely cover filling. I add a bit more milk than called for in the package so the mixture is thinner and easier to spread. 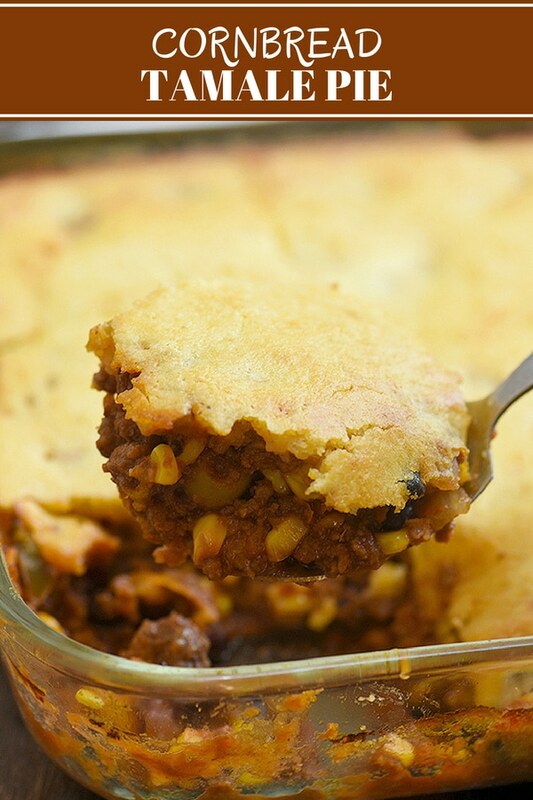 It creates a tender, fluffy crust that goes well with the hearty beef filling. If you prefer a thicker layer of cornbread, just double the topping ingredients called for in the recipe. Bake in a 375 F oven for about 15 to 20 minutes or until top is golden brown. 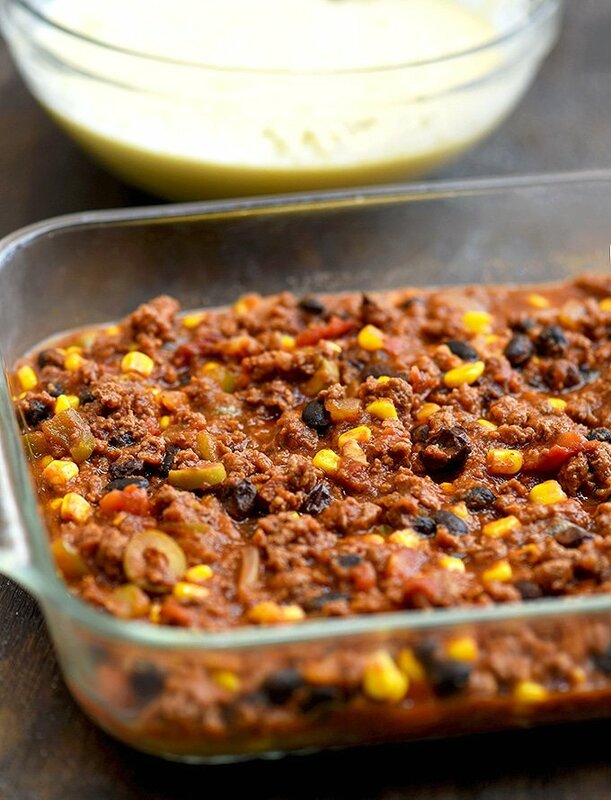 You can serve the tamale pie casserole like a spoon bread or cut it into neat squares. Garnish with sour cream, shredded cheese, chopped tomatoes and green onions for additional layers of color and flavor. 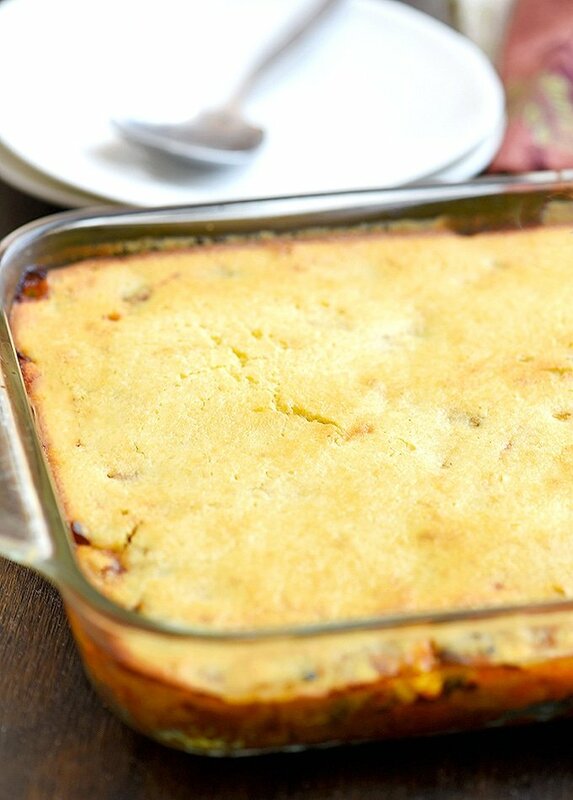 If you love tamales but not up to the work involved, this cornbread tamale pie is for you. You get all the flavors you love ready to enjoy in less than an hour; perfect for a weeknight dinner meal! 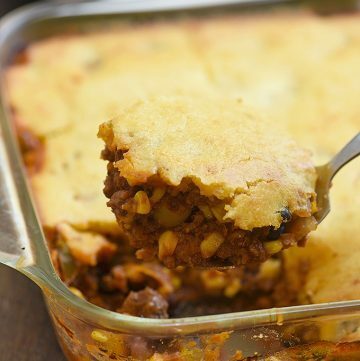 Tamale Pie is two classic comfort foods baked into one fantastic casserole. With seasoned beef and a golden cornbread topping, it's a hearty and tasty weeknight dinner the whole family will love. In a large pot over medium heat, heat oil. Add onions, bell peppers, and garlic and continue to cook until softened. Add ground beef and cook, breaking apart with the back of a spoon, for about 4 to 5 minutes or until lightly browned. Add diced tomatoes, tomato paste, and broth. Add chili powder, cumin, and cayenne pepper. Stir to combine. Bring to a boil. Lower heat, cover, and simmer for about 10 to 15 minutes or until beef is cooked and liquid is reduced. Add black beans, corn, and olives. Continue to cook until heated through. Transfer beef mixture to a lightly greased 9 x 13 baking dish. In a bowl, combine cornbread mix, egg, and milk just until blended. Batter will be slightly lumpy. Spoon cornbread mixture on top of filling and spread on top. Bake in a 375 F oven for about 15 to 20 minutes or until top is golden brown. Serve hot with sour cream. I increased the amount of milk more than specified by the cornbread box to make batter easier to spread and as I prefer a thinner cornbread layer when baked.